I am new to the forum and thought what better way to introduce myself than to start a journal for my nano! A little bit about me, I am a graduate student at the University of Michigan and will be graduating in 2019. I am originally from Chicago - hence the username! 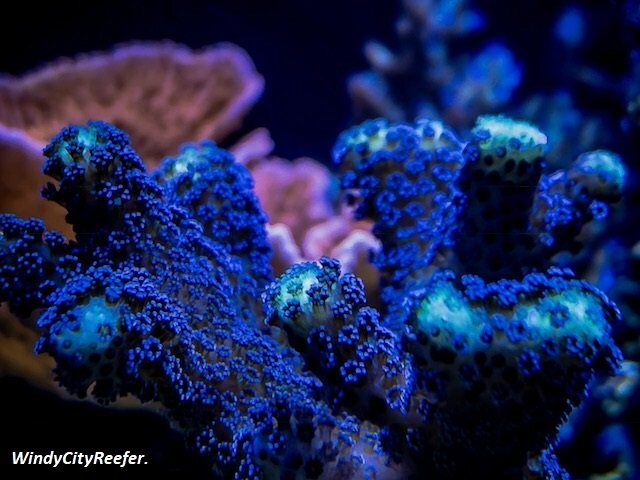 I have been in the hobby for about 10 years and have had tanks from FOWLRS to full blown reefs. I have always wanted to start a journal for one of my tanks but never really got around to it. As a graduate student this has made things a little more difficult. But I recently came across a deal I could not pass up that is perfect for my situation! The goal is to document everything in this thread. Let me introduce to you my new nano! The tank currently has 2 clowns, a starry blenny and a mix of SPS and LPS. Here are a couple photos! Pardon my cell phone photos, I am working on getting a better camera.. I appreciate the warm welcome. I have been trying to snap photos here and there but those two were the best. Still trying though! Here are a couple slight modifications I made to the tank. First off, the stock mesh top blocked a fairly considerable amount of light from the prime. So I went ahead and made a switch! So much better. Welcome to the community @WindyCityReefer.! I'm glad you're enjoying our new site, it still has that new car smell from our upgrade in February. Looks like you're off to a great start with your IM10, that's a rad livestock collection. How long has it been up and running? Clever upgrade on the mesh screen, and more insight on the process you can share? I'm sure it will help others improve their own screens. Thanks! The tank has been up for about a year. 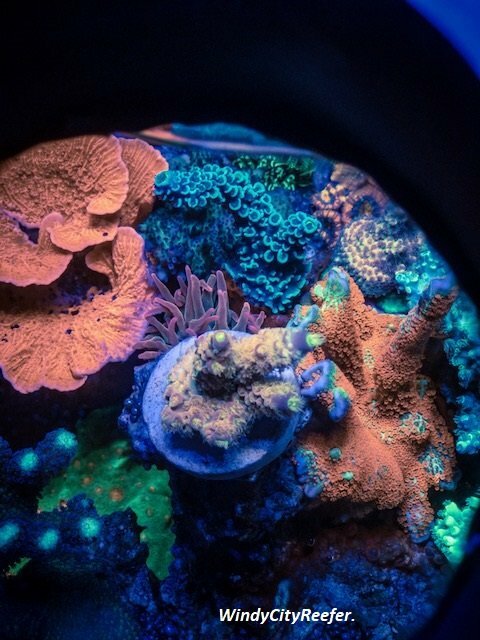 The plan is to keep SPS towards the top and allow some LPS to fill in the bottom of the tank. I got a bulk amount of the mesh screen from a fellow hobbyist in the Chicagoland area when they were getting out. It is almost like a thick nylon material. Similar to screen door there is an outer rubber strip that secures the stock mesh. I simply cut the mesh to size, removed the rubber strip and switched out the screens. Here are some photos of the other side of the screen for reference as well as an older photo with the screen on the tank. I hope this helps someone out! I definitely have seen an improvement in the amount of light reaching the tank. Most would say to ditch the top altogether but seeing as I am in school usually from 8am - 6pm I wanted to make sure I would not have any jumpers. Well I made a stupid mistake this week.. Added in a considerable amount of carbon and purigen and my LPS did not take too kindly to it. They are all slightly receded and not opening up. Took some of the carbon and purigen out and hoping for the best. 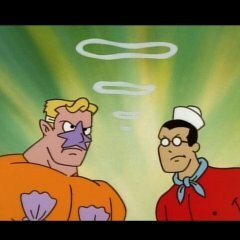 I also tested alk after my water change and the next day and I went from 10.5 to 7.3. Does that seem normal? I bought some ESV 2 part to possibly help with compensating for the drop in alk. The instructions say dose 1ml per 4 gallons to start. This is my first time dosing so I want to make sure I am doing it right. I was planning to add 2ml to see how it effects the system. How big of a jump should I see in the alk? Should I add the same amount of calcium? I am also manually dosing. Decided to move to a more high-end SPS oriented system and found that the AI prime was not going to cut it. Thankfully I have a set of AI sol super blues from a previous system. It took some critical thinking but I was able to mount one sol over the tank. The tank still has some ricordias and mushrooms but those will be moved to my father's system soon. Will post some growth shots but here are a few photos! Really nice looking tank, thanks for sharing and looking forward to seeing what you do with it! 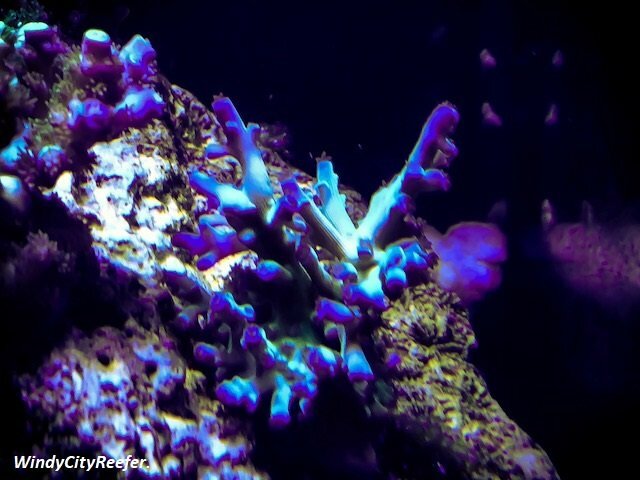 I just transferred my reef to the IM 10 and am loving it. It is always fun to see what other people end up doing within the same 'box' because things end up so differently. Thank you! I am excited to see how the tank grows out. My goal is to make the tank look larger than it really is. 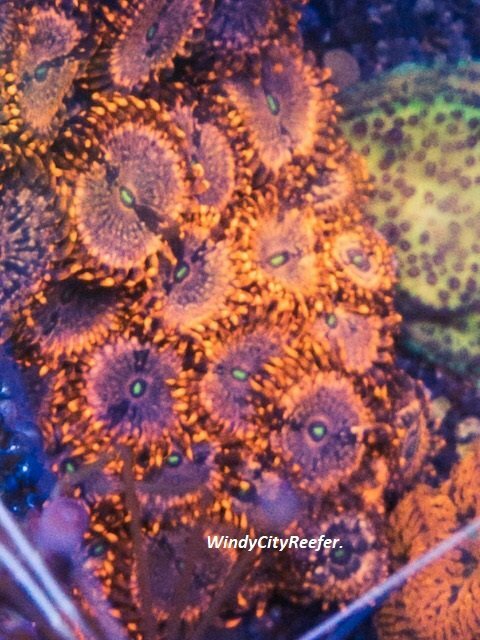 After I remove some of the rock with the remaining soft corals that should do the trick. Do you have a build thread? I'd love to take a look! Well time for a big update! I just returned from my 2 week winter recess - no casualties! So I will be working on the tank a little more but, after today's water change I took some individual photos. That is one nice fellow hobbyist to know, what a list! Thank you! 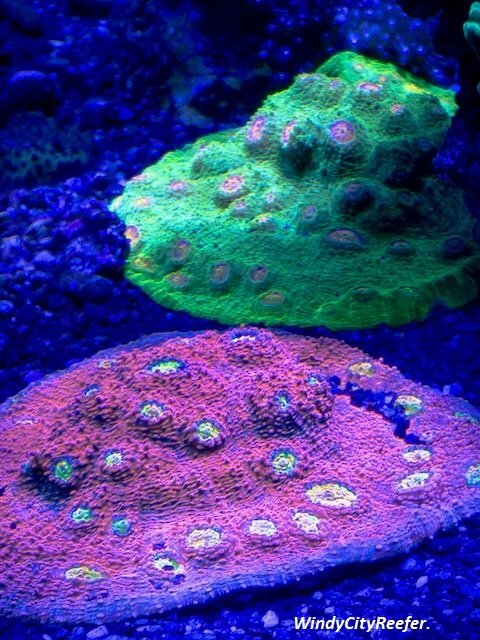 I will definitely have some frags available in the near future. Growth has been really good! Here are a few more photos I took today. Thought I would include some LPS shots as well. 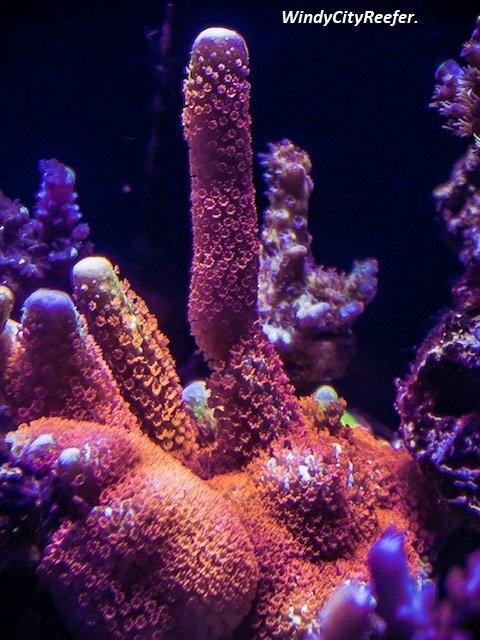 I have to say I am impressed by the growth of the orange montipora. Came across a gorgeous blue squamosa clam I could not pass up. The color in this guy is unreal! 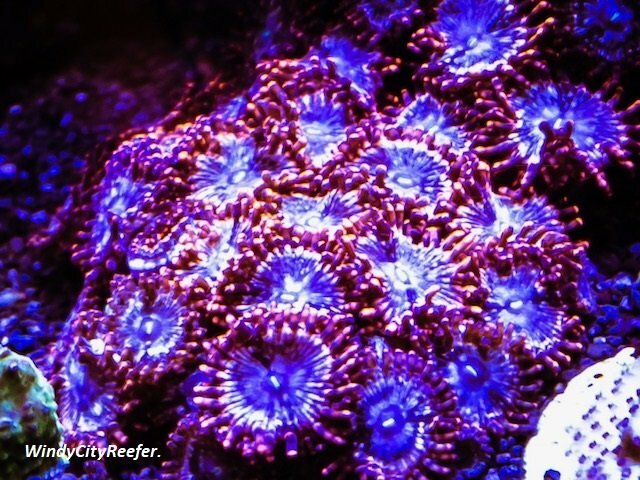 I also picked up an ARC fireworks acro frag from Jason Fox. Still waiting to pull some color out of it before posting some photos. More photos to come after I complete my routine maintenance this week! Well, guess who developed a taste for the clam? The cleaner shrimp.. Unfortunately, I could not get the shrimp out without taking everything apart so I decided to transfer the clam to my father's 100 gallon display. There the clam is doing great. At first I figured the shrimp was just grabbing food but, I witnessed him literally pulling parts of the clam's tissue from the shell. Seeing as I feed the tank heavily every day I did not see a bright future keeping the clam in the system..
On a brighter note, I got a new camera! 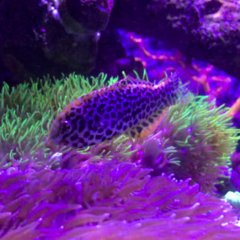 Below are a few photos of the tank and corals. Everything is doing great even with my chaotic schedule at school. Essentially the tank has been self-sustaining besides the doser and ATO. Hope everyone enjoys! 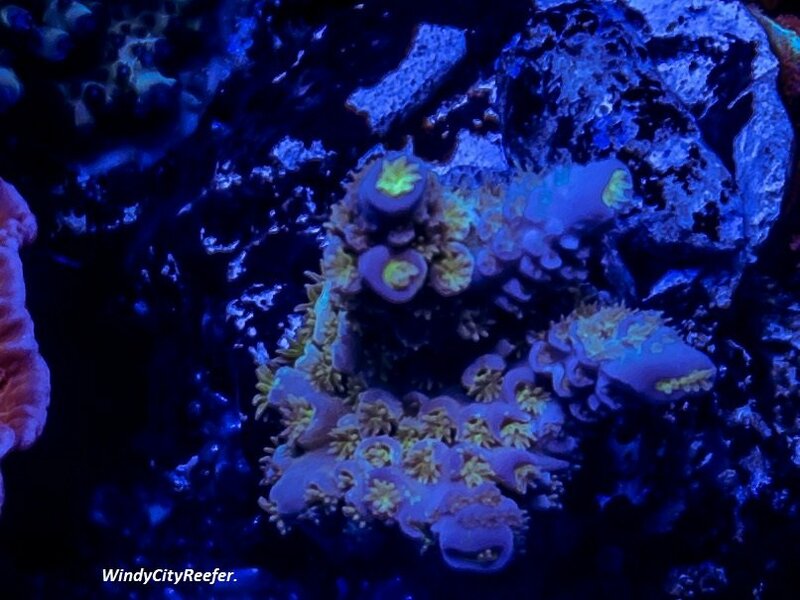 Beautiful shots @WindyCityReefer., everything is so vivid! What kind of camera did you get? 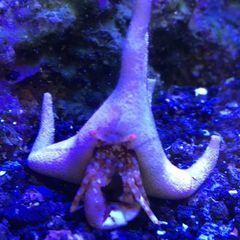 Thats too too bad about the clam, I’m surprised the cleaner shrimp bothered it so much. Like @Christopher Marks Said, the shots are impressive! The tank is looking great so far, it will be cool to watch it progress. Nice to see another student doing this! Your tank looks awesome! Shows the difference between someone who's been in the hobby for a while vs me lol. Very nice. Thank you! I am using a Canon 5d mark 3. Yeah I was definitely bummed and would have rather kept the clam but, it was not worth dismantling the tank. Thankfully my father has a mature setup so I will still be able to enjoy watching it grow whenever I make trips back home. Thanks! It is amazing how much a camera can make a difference. The tank is a little over a year old now. A lot of SPS are getting closer than I would like.. I am sure I will pull the clippers out sooner rather than later. I'd love to take a look at your tank if you have a thread going! Yeah of course! Im an undergrad student right now and I'll be graduating the same year! I'm into the whole YouTube thing and so I post more videos than pics on there but lately I've uploaded some pics. Just posted a video today of my largest frag haul! Looks great! I like the video approach you are taking with documenting everything. Very cool! I decided to take a couple more photos today. Some I liked and others not so much. I have found that getting the most ideal lighting is easier said than done. 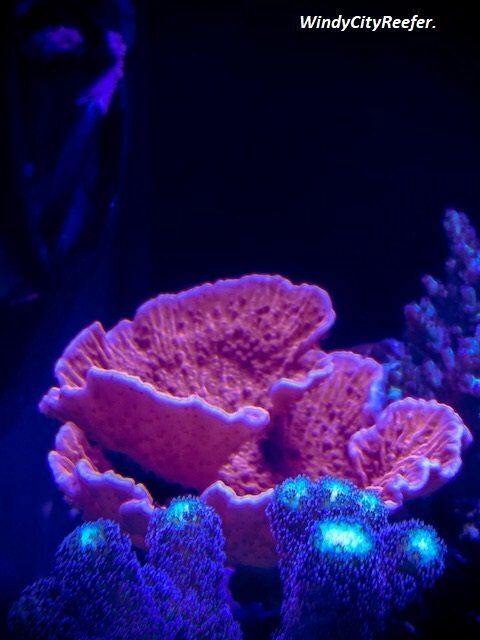 Below are a couple growth shots and my chalices. Don't get me wrong, I love my SPS but the LPS need some attention! I am blown away with the growth on the orange cap and milka stylo. Thank you for checking it out! It has helped me keep track of progress and even saved my female clownfish (by being able to go back in time)! I figured I could help inspire others who are just starting out in the hobby, as well! Wow!! You take some really stunning photos. That is something I need to work on! This is one amazing tank! Can I ask you what your maintenance system is atm? 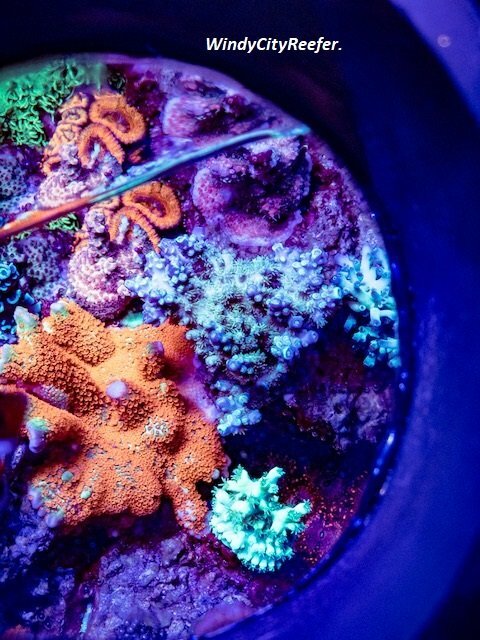 How often do you do water changes and what do you dose and such? I am in college too, but still afraid to leave my tank alone for more than a few days (which not very nice. Considering I would like to be able to go on holiday for two weeks this summer). I have a 16G. 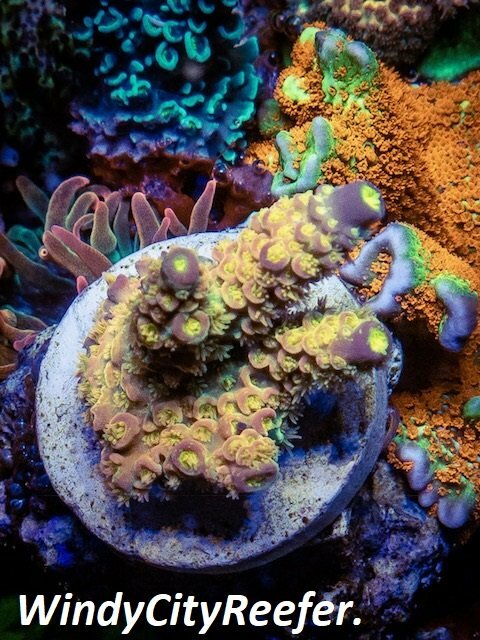 Two clowns and only very easy corals. Picking up a dosing system tomorrow and planning to use the dsr ez method. Wow wonderful setup. Colors are popping like crazy!